Okay, I know you are asking yourself, “Velveeta Fudge, has Stacey lost her mind?” Well the answer is yes and no. I feel like I have lost my mind sometimes but this is not one of them. An artist friend of ours made this at our homeschool Holiday party and I did not get the recipe or she was not giving it, hee hee. Anyway the internet came to the rescue and I found this recipe on About.com and will add my helpful hints from making this as you read the recipe. Give this a try and you will be pleasantly surprised! I love it and it is EASY to make!!!!! In a non-stick saucepan over medium heat add Velveeta and butter. Stir constantly until it is all melts together. Remove from heat. Add the powdered sugar and cocoa. Mix until well blended, and then add your dry milk. Stir until all is smooth and somewhat fudge like. Finally add your vanilla and stir well. Pour into pan of your choosing. I poured mine into 2 pie plates. Cover and place in fridge until set. Cut into squares and EAT!! Yummy, I promise!! Velveeta, eh? Okay, I'm intrigued enough to actually try this. 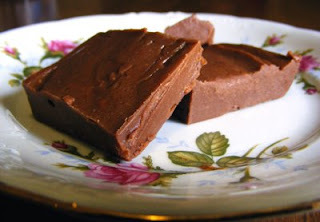 Cheesy fudge. Whodda thunk?